My creative process always starts with the beads. I could get lost looking at beads and making my own. The only time I start with a sketch or planned design is when I am using my loom. I then I just go with what strikes me. As for me I am 33 years-old and was found to be disabled almost 2 years ago by my physician. I suffer from a rare liver disease that is called nonalcoholic steatohepatitis. I have a 2 year old son named Nero. My husband's name is Nakoa. I began making jewelry as an escape from my woes and as a way to help my family make ends meet since I can no longer work. I started by making jewelry as gifts for my mom and mom-in-law. I have sold a few items on etsy but have a growing facebook page for my work. The first piece, Arrows (shown above), was inspired by Native American designs and symbols. My great uncle was a shaman and my husband is Native American. My mother would read Native American legends to me when I was little. I have always had an interest in the Native American culture. I created the design before beginning the weaving process. I picked the colors just by what looked good to my eye. 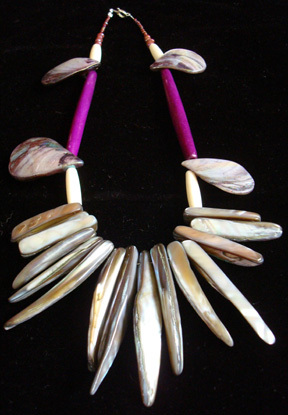 The second piece, Bone and Shell necklace, was inspired by my mom. She would wear similar jewelry when I was a kid so I thought what the heck and made something that reminded me of my childhood. I used abalone shell and bone beads. The third piece is made from amethyst nuggets and chips, aventurine, amazonite, and opalite. I love to put green and purple together. I just find the color combination to be calming and beautiful. I love to use real semi-precious stones whenever I can. Nature is my biggest inspiration. It is so amazing and awe inspiring that I rarely need anything else. I love your jewelry... Your love does show thru! 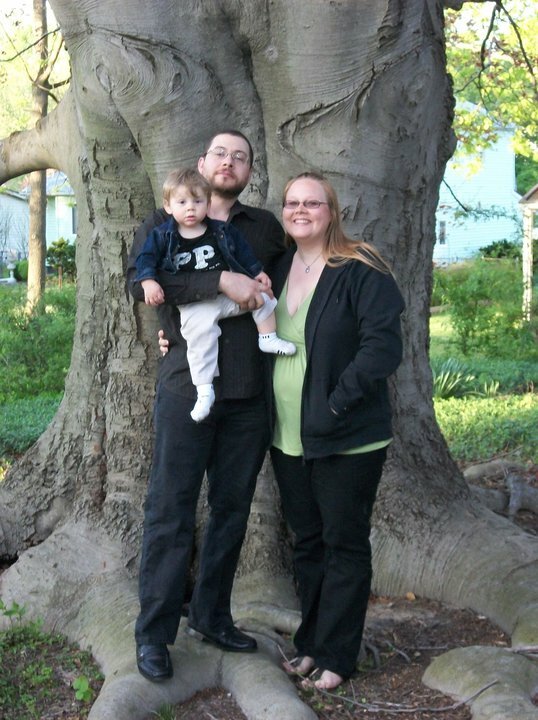 what a beautiful picture of Sarah and her family! The jewelry is gorgeous too- I really love the necklace with the abalone shells and bone beads!! I have to commend you on your honesty. I've never felt that comfortable sharing my disability with the outside world. I've always loved to create, and beading can be very therapeutic and help to take my mind off the pain. I started working when I was 13, so when I couldn't work any longer I felt ashamed. 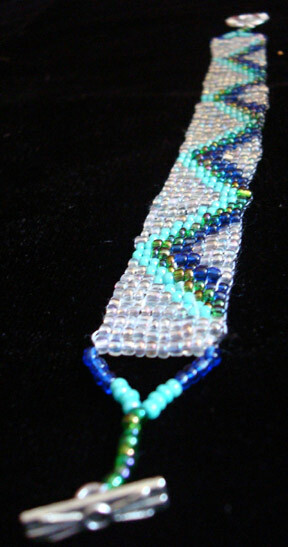 Beading does help me to continue to feel some independence. So far i've spent more then I've made, but hopefully someday it will also become extra income. Thanks for being so open and sharing your story :) It was comforting.